Born in 2007 as a new district, Chikballapur rose out of what was earlier a part of the district of Kolar. Today, the district headquarters, Chikballapur is well on its way to becoming a hub of economic and social importance in the state of Karnataka. Numerous real estate insiders believe that Chikballapur is very close to being included in what is known today as “Greater Bangalore”. The reason for all this hype surrounding the humble town is the large number of high investment construction projects that are being planned in and around it. The famed traveler’s bungalow is undergoing transformation to emerge as a state of the art bus terminus. $5 million is going into the construction of a new police and government headquarters in the area. The underground sanitary system is being rehabilitated at a total cost of over $10 million. A Special Economic Zone for Pharmacy is in the pipeline, estimated to cost over $400 million. The SEZ will be the first of its kind in India, an achievement of epic proportions for the district. Several educational institutions including medical and engineering colleges of repute are upcoming projects in the area making Chikballapur anything but a small rural town. A BIAL IT Investment region is also in the pipeline a short distance away from the town. It is estimated that the IT project will the largest undertaking of its kind in Karnataka and it will be the largest IT region, for now, in India. With grape, silk and grain cultivation being particularly high in the area, the economy of the area is dependable owing to the varied sources of revenue. As the subtitle suggests, the name “Chikballapur” literally translates into the town that uses small measures for its grains. Having been an agriculturally important town in history, it is not surprising that its name has agricultural references. The town has changed several Royal and foreign hands before being declared as a part of Independent India. The native people of Chikballapur have always had a fierce sense of pride and honor, refusing to be ruled for long periods of time by any foreigners. The presence of Nandi Hills is of special importance in the area as it made for great hideouts in times of war. NandiDurg or Nandi Hills as it is colloquially known is essentially an ancient fortress that has stood tall against the ravages of nature and time. Located just 10 kilometers outside of the town of Chikballapur and 60 kilometers outside of Bangalore, Nandi Hills has always been a quick weekend getaway for Bangaloreans. The hill is not only important because of their history but also because of geography as the Arkavathy River is believed to originate from the Nandi Hills. The origin of the name “Nandi Hills” is not very clear and is attributed to numerous sources like the shape of the hill and a yogi who performed penance in the hills. Bhoga Nandeeshwara temple: The Dravidian style temple in the hills, however is most probably the root of the nomenclature of the hills. 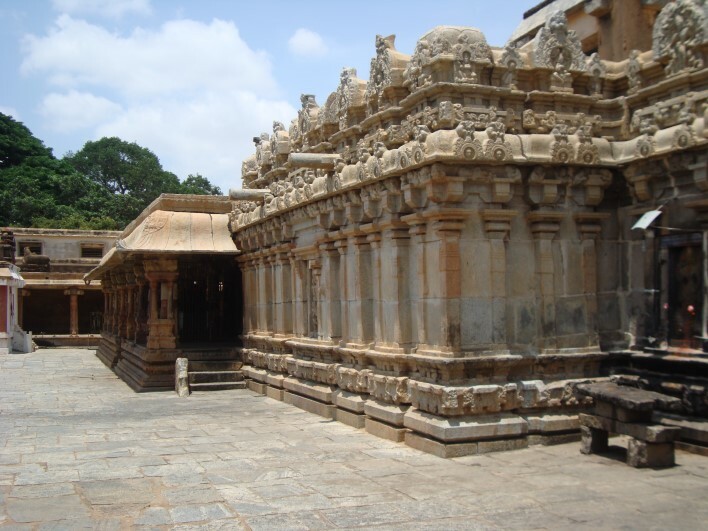 The Nandi temple is believed to be over 1300 years old and is known as the Bhoga Nandeeshwara temple. The temple is believed to be one of the oldest places of worship in Karnataka and is believed to be hewn completely out of rocks native to the area. Kalyani pond: The majestic kalyani pond and the adjoining marriage hall evoke a sense of wonder and humility at the ingenious minds of those who built the magnificence. The stone carvings that adorn every inch of this great temple inspire artists and architects to this day. Tippu’s drop: Of all the tourists spots in Nandi Hills, Tippu’s drop is perhaps one of the most visited and photographed sites. Tippu Sultan apparently threw his condemned prisoners to their inevitable deaths from this point. The stunning views from this high point however make for very good photo opportunities. The stone doorway on the North Eastern side of the fort was the route that the horses of yesteryear took to enter the fort. Today however brave drivers try maneuvering their cars through the relatively narrow passageway. The greatengineer and statesman Sir Mokshagundam Visvesvarayya is born in this small town.The town is all set to undergo massive transformation with the BIAL IT investment region taking root in the area. A metro rail, a railway station and a railway line are also being proposed to offer better connectivity between the town and Bangalore. The gondola lift from the summit of Nandi hill to the town of Muddenhalli will definitely transform tourism in the area. The memorial constructed for Sir M Visvesvarayya on land owned by his family is the main tourist attraction in town currently. The town of Chikballapur is well connected to Bangalore, in fact it is considered to be a transport hub for North Bangalore. The six lanes National Highway 7 and the National Highway 234 run through the city. With the new bus and train terminus set to open soon, the town is one the most well connected towns to the metropolitan city of Bangalore. Private and Government buses have regular routes between Chikballapur and Bangalore covering all the small towns in between the two stops. Autos and rental cars are readily available between Bangalore and Chikballapur, especially from North Bangalore. The Bangalore International Airport, located just 20 kilometers away is the nearest point of air connectivity for the town of Chikballapur. The town of Chikballapur is a unique destination with a stark contrast between the old world charm and all the trappings of a global village taking root in its midst. Its easy connectivity to Bangalore makes the place a weekend getaway with a historical flavor. Visit Chikballapur for the history, religious places of worship or simply to take a breath of fresh air at the summit of the magnificent Nandi Hills.